What is an Automatic Grill Timer? Some of the grill toys out there may seem like just that, toys. Something that you really don’t need for grilling at all. The automatic grill timer, however, is a tool for precision, turning grilling a steak from a hobby into an art while contributing to the safety of your family and your home. 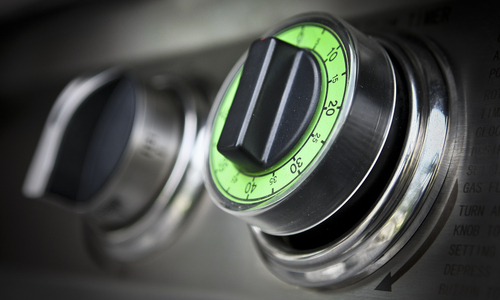 The automatic grill timer attaches to your gas flow. Think of the “cook time” function on an oven. You set the timer for a specific number of minutes and, if you get distracted by guests, the kids, or even a great play in the game you’re watching, your automatic grill timer will turn your grill off at the perfect time. Your steak or burgers or whatever else you might be grilling will be cooked to perfection, even if you get pulled away unexpectedly. A lot of people seem to think that the automatic grill timer is a bit redundant or unnecessary. In this article, we discuss some of the reasons why this tool is important for precision, safety, and convenience. We’re sure that, once you've tried an automatic grill timer, you’ll never go back. Can’t I just use a regular kitchen timer or a timer on my phone? Sure. As long as you’re sure that you’ll hear it and will be able to tear yourself away from whatever requires your attention at that moment. Oftentimes, even if we turn our phone alarm to the highest setting, we just can’t hear it over the noise of our guests. Does it really matter if my steaks are a little overdone? Most of these scenarios have your food cooking for only a few minutes longer than you’d like. Two minutes really may not make that much of a difference after all. So, does it really matter? For many of us, two minutes is the difference between rare and medium rare. If you’re really just trying to cook something so that’s edible, then precision probably doesn’t matter, but if you want to make something that gets your guests talking about your cooking skills for weeks to come, then those two minutes are essential. How is the Automatic Grill Timer a Feature? In an ideal world, a grill never goes unwatched. That said, we all know that grills sometimes do go unwatched for a whole swath of reasons. For example, if you hear your kids screaming or crying, you probably are going to run straight for them rather than worrying about an unattended grill. Luckily, no matter how long it may take to tend to them, the automatic grill timer will ensure that your grill turns off after a fixed number of minutes. This feature thus actively prevents your food from turning from a grilled feast into a charred fire starter. Try an automatic grill timer today to increase your grilling safety, precision, and convenience. We’re sure you’ll be pleased with the results!